Critical Thinking: The Case of CDR Benjamin Strickland, UCGC Vol. 01, Nr 01. The Case of CDR Benjamin Strickland, UCGC Vol. 01, Nr 01. General David Petraeus, a 4-star general with over 37 years in the military, was the most senior officer to be prosecuted during the politically correct era. He was just one of many distinguished senior officers to be purged from all branches of the military services during that period. Commander Benjamin Strickland, U S Coast Guard was caught in this web of insanity. This is a purge. 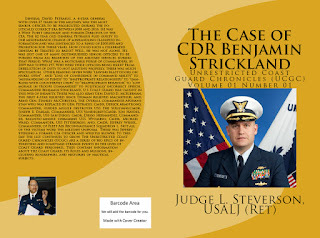 Consider the Case of CDR Benjamin Strickland. To this day the list continues to grow.The Unrestricted Coast Guard Chronicles (UCGC) are a series of bio epics of interesting and sometimes strange events in the lives of Coast Guard personnel. This is the Case of CDR Benjamin Strickland. This is a must read for all right thinking Americans, and people of goodwill everywhere. Sales of NEW BOOK began July 7, 2015. Send check or money order for $27.00, includes shipping and handling to: Steverson Books, Box 606, Haymarket, VA. 20168. Get the full story. The Case of Commander Benjamin Strickland, 114 pages. All pictures are full color. Many distinguished senior officers are being purged from all branches of the military services. To this day the list continues to grow. On June 26, 2015 Commander Benjamin F. Strickland retired from the U. S. Coast Guard. This Unrestricted Coast Guard Chronicle (Volume 01, Number 01) was designed to coincide with that date. He will not be forgotten. His name will live on in the Chronicles of Coast Guard History. His story will forever be told around the Forecastle, at the camp fires, and in the restaurants and bars where retired service members gather to reminisce about life in the Nation’s oldest continuous seagoing armed force, the U. S. Coast Guard. His brilliant and distinguished career was brought to an abrupt halt for no explicable or rational reason, except that he did his job as he was required to do it. In doing so he became a victim. No good deed goes unpunished. This means that life is unfair and people can do or try to do good things and still end up in a lot of trouble. Bad things happen to good people. Terrible and unexpected things happened to CDR Strickland.
. Power was misused; discretion was abused; authority was exceeded; rights were trampled; resources were mismanaged; and, our posterity has been neglected. We are at the mercy of the powers that be, and they appear to be devoid of all mercy. Heaven help us; and, God Bless America. I'm Mad As Hell!! And, I'm not going to take it any longer. This is BIG! This is historical. This is a Case of First Impression. Maybe this is not the first time something like this has happened in the Coast Guard; but, this is the first time it has been thoroughly documented. This Case and this Book are the result of hundreds of man-hours of research, eye witness interviews, and analysis. The actual players in this tragedy were painstakingly interviewed and interviewed again. The facts were checked and re-checked. The facts are absolutely accurate and indisputable. The Time Line is accurate right down to the day, the minute and hour. Two people can understand and analyze the same facts and come to different conclusions. We are all different in some ways. We are what we were then and when and where our characters and personalities were shaped; BUT, we cannot dispute the FACTS. You are entitled to your own opinion, but you are not entitled to your own facts. The Facts are absolute. They are black or white; they cannot be a dirty shade of grey. Not one shade , nor fifty shades of grey. This is a piece of living history. What price can you put on History? We are living in History, at a pivotal moment in history. Owning this book, is like taking a "selfie" in the Flow Of Living History. Imagine being able to capture yourself at The March on Washington, The Collapse of the Berlin Wall, at The WTC on 9/11, or some other historic event that took on epic proportions as time went by. How would you be able to describe it to your children and get the facts right? How else would you be able to set the stage and get the passions and the emotions just right to explain and to understand what was happening in the country and the world at this crucial time in our history? This Book captures it. It hits the nail right on the head. It nails it dead center. There has never been a Ben Strickland in the Coast Guard Officer Corps, and there will never be again. What happened here will probably never again be repeated, partially because it was recorded and exposed. Just like the first time a Coast Guard Academy cadet was court-martialed (Cadet Webster Smith). It too will never happen again. The book about that case exposed the fallacy, and the stupidity, and the utter futility of it. The Case of CDR Benjamin Strickland will go down in history as being one of a kind, unique. The story will be told again and again. Rumors will abound. People will embellish. But, if you have the book, you have the facts, the Truth, the piece of living History. It is eternal. It will live in infamy. How can you put a price on that?